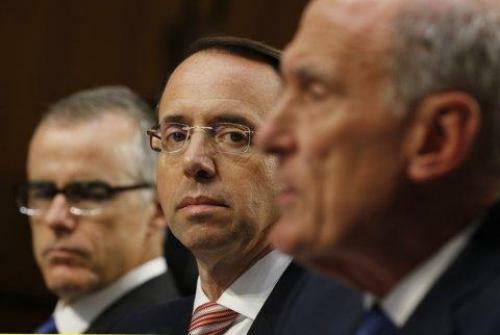 The knives have been out for Rosenstein for weeks, as Congressional investigators have repeatedly accused the DOJ of “slow walking” documents related to their investigations. Frustrated lawmakers have been given the runaround – while Rosenstein and the rest of the DOJ are hiding behind the argument that the materials requested by various Congressional oversight committees would potentially compromise ongoing investigations. In late June, Rosenstein along with FBI Director Christopher Wray clashed with House Republicans during a fiery hearing over an internal DOJ report criticizing the FBI’s handling of the Hillary Clinton email investigation by special agents who harbored extreme animus towards Donald Trump while expressing support for Clinton. Republicans on the panel grilled a defiant Rosenstein on the Trump-Russia investigation which has yet to prove any collusion between the Trump campaign and the Kremlin. “We are not in contempt of this Congress, and we are not going to be in contempt of this Congress,” Rosenstein told lawmakers. Republicans, meanwhile, approved a resolution on the House floor demanding that the DOJ turn over thousands of requested documents by July 6. And while the DOJ did provide Congressional investigators with access to a trove of documents, House GOP said the document delivery was incomplete, according to Fox News. That didn’t impress Congressional GOP. Rep. Meadows, meanwhile, fully admits that the document requests are related to efforts to quash the Mueller investigation. “Yes, when we get these documents, we believe that it will do away with this whole fiasco of what they call the Russian Trump collusion because there wasn’t any,” Meadows said on the House floor. Meanwhile, following a long day of grilling FBI counterintelligence agent Peter Strzok, House Judiciary Committee Chairman Bob Goodlatte blamed Rosenstein for hindering Strzok’s ability to reveal the details of his work. While Rosenstein’s appears to be close to the chopping block, whether or not he will actually be impeached is an entirely different matter.